You'll notice that this list has been incredibly male-dominated up to this point. Sorry about that, I didn't mean for it to work out that way. Maybe it's because males on the show tend to be more over-the-top than females. I don't know. But in any case I realize that this list has mostly been populated by males. At least... up until now. Our entry at #75 is dedicated to one of my favorite players of all time, Helen Glover. And I'm thrilled to finally get a chance to write about her, because I truly believe she's the most underrated character of all time. And I'm talking males or females here. 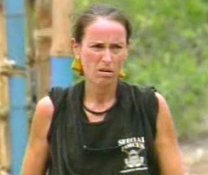 In terms of pure entertainment and character development, I just don't think it got much better than Helen Glover. 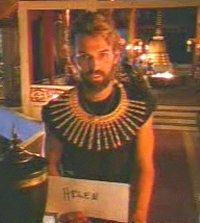 Why did I like Helen so much? Well mainly it was because she was such an anomaly. On one hand, she came off like this prim little New England school marm. She had a short fuse with people, she wasn't tolerant or patient in the slightest, and she would bite your head off if she disagreed with anything you said. Plus she seemed like a bit of a prude. So there was that side of her, which was entertaining enough in itself. But on the other side you had this extremely emotional and giddy little schoolgirl, who would jump up and down at the slightest bit of good news, or would squeal with delight if her husband got to come and stay on the island. 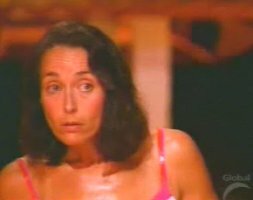 If Helen got the tiniest bit of good news during the game, she would turn into Squealy McGigglefest. And it was such a strange switch from the pissed off school marm she normally showed to the cameras. So anyway that's why I liked Helen Glover so much. 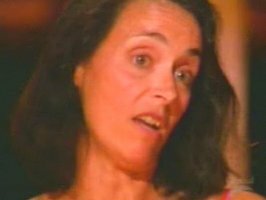 She was entertaining, she was unpredictable, she was likeable... plus as a bonus she would give these incredibly pained confessionals when things didn't go her way. Like Rupert, she was almost entirely id-driven. When she was upset, she was really upset. When she was happy, she was really happy. Her heart was always very visible on her sleeve, and that is the type of character who makes for some outstanding TV. The only problem with Helen is that nobody really cares about Thailand. In other words, people tend to forget about her. And it's an awful shame, because she was one of the best. 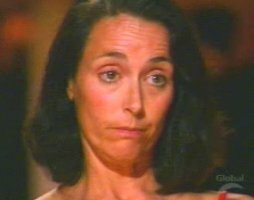 Helen's complete inability to hide her anger. 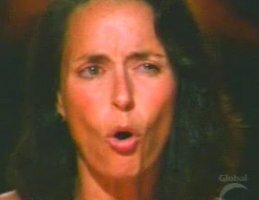 This is after she lost the final four immunity challenge. 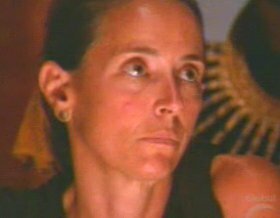 Helen and Brian were tight allies all throughout Survivor: Thailand. They were the two hardest workers around camp, they were both extremely bright and strategic players, and they trusted one another implicitly all the way to the end. They were destined to be the final two players in Thailand. Well... that was Helen's intention, anyway. 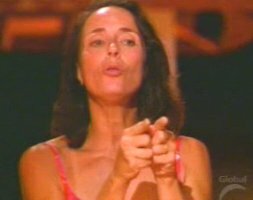 She planned to stick with Brian all the way to the final two. But as for Brian? Well let's just say his strategy was exactly the opposite. His strategy involved Helen leaving the game at the final four. And that's exactly what happened at the start of the Thailand finale. Helen was blindsided at the final four. And Brian was the one who put the biggest of the three knives in her back. So Helen was blindsided. She didn't see it coming, it hit her smack between the eyes... and it's safe to say she wasn't really all that thrilled about it. Especially because she had some of the most memorable final words of all time. Helen's wonderful final words: "To the three of you left in the game, I just want to say break a leg. And I mean it." Helen listening to Brian talk. She wouldn't even look at him. And then it finally happened. Brian ended up being in the final two and, much to our delight, Helen finally got a chance to confront him. We expected a memorable performance from her, and that's exactly what she delivered. 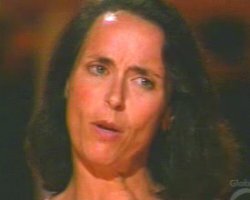 Helen gave us a moment to be remembered when she squared off against Brian in the final Tribal Council. I'm not going to recap their whole conversation here, other than saying that Helen was mad at Brian for breaking his word to her without so much as a warning on the way out. 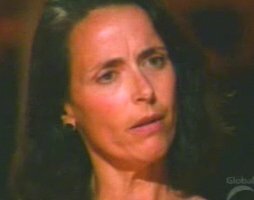 No, instead of recapping I'm just going to show you the pictures of Helen's face during her angry tirade. 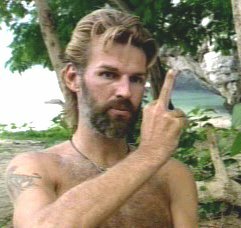 Because in twelve seasons of Survivor... 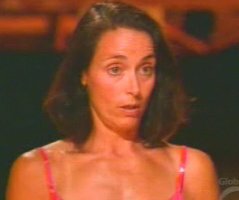 I don't think there has ever been a more entertaining jury performance. She bobbed. She weaved. She yelled. She was like freaking Muhammad Ali. And the very best was at the end, when she got so mad she even growled. She literally growled! She got so angry that Jeff had to tell her to back off and actually let Brian have a chance to answer her questions. It really was a sight to behold. This is my favorite part. 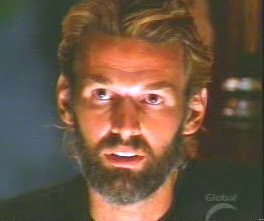 This is where Helen growls at him, and Jeff has to tell her to back off. "Well, it's little late now." So anyway that's the Helen Glover experience. 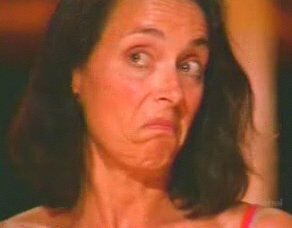 Her animated showdown (and complete intimidation) of Brian ended up being one of my favorite moments of Survivor: Thailand. P.S. Like I said, Helen was one of my favorites in terms of a player who could consistently make me laugh. She was funny without even trying to be funny. In fact I would rank her right up there with Sandra as the funniest two females they have ever had on the show. 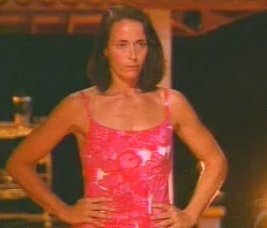 I'd probably rank Katie from Palau (who, unlike the other two, tried very hard to be funny) at number three. P.P.S. 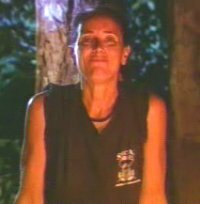 Earlier, I called Helen the most underrated female ever in terms of being entertaining. If I had to pick a male to say the same thing about I would probably pick Clarence from Africa. Don't worry, we will get to him later in the list. P.P.P.S. Oh yeah, and Helen is also one of the coolest Survivors in real life. 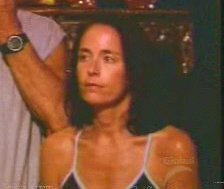 She was a big fan of All Star Survivor: Alaska (a story I wrote a few years ago with her in it). Helen liked my story so much that she traded me her recipe for butterscotch cookie bars (the one she talked about during Thailand) for a paper copy of Survivor: Alaska. So if you are reading this, thanks again Helen!